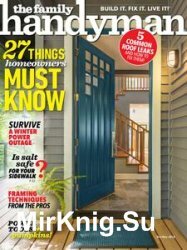 The #1 magazine for Do-it-yourself homeowners. Step-by-step maintenance, repair and improvement projects, plus tool skills, DIY tips, and product buying advice. Lots of great ideas on storage, weekend projects, improving your yard, woodworking, and decor.